Considering the pessimistic, i.e. realistic outlook for yesterday’s game against Flamengo, the draw was a good result (even though Palmeiras could have returned home with three points, as the carioca goal featured a participating player in the offside position). Even more important: players gave 100 per cent and seemed focused on nothing else but the game. The squad demonstrated unity, indicating that the doomsday predictions were exaggerated and that Scolari is still very much on top of things. Watch the game highlights below. Kleber drew the shortest straw. After a very heated argument with Scolari the night before yesterday, the “Gladiator” didn’t travel to Rio de Janeiro with the rest of the squad and Scolari categorically and repeatedly confirmed – both before and after the game – that Kleber would not be playing under his command again. Director of football Frizzo echoed the decision this morning on returning to São Paulo, confirming that Kleber will be training separately from the rest of the squad and that he will not wear Palmeiras’ jersey again. It seems like we’re de facto coming to the end of “Klebergate”; that frustrated attempt of our very own Judas to get a substantial salary raise by threatening a transfer to Flamengo (which included faking injury in order not to reach the seven-games-played transfer limit). 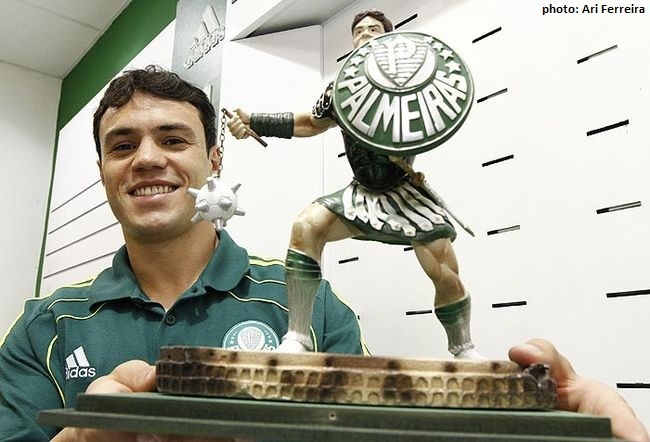 There are today many a Palmeiras supporter wondering what to do with that once favourite #30 jersey, not to mention those poor sods who bought a wretched “action figure”. Serves as a lesson to us all: players come and go but Palmeiras is eternal. One needs to choose “idols” carefully; in activity at Palmeiras today, there’s Marcos. No one else. End of story. – This might not have been the first time João Vítor is in trouble with supporters. The police are investigating if Tuesday’s incident is the continuation of previous unresolved business. – Possibly, there was only one supporter approaching João Vítor and the other two. When things got physical, the other supporters came running. The above information might explain why the official note by Palmeiras was surprisingly vague and only made reference to the upcoming police investigation. There’s always (at least) two sides to every story. Stay tuned. Thanks for the update! Interesting as always. That’s it Adam: start scoring. The offensive force, with Valdivia injured, Lincoln below expectations, W. Paulista out of position, Kleber with his had somewhere else… It hasn’t been easy.